Our chickens are eating our weeds; their eggs taste fuller as a result – all due to a conversation with a man about his goats. This past weekend I met a man who has a few hobby goats. I asked him if it is true that goats are very destructive to the land. He replied, “No, goats prefer to eat upwards. They are browsers not grazers.” The way he said those words jolted my brain into noticing I had never consciously thought of the difference before. So I did some research. Deer and goats are soft vegetation browsers, which is why they love azalea leaves, fruit, and your prize peonies. Sheep and cows are grass grazers, which is why their teeth have such high crowns to grind the fibrous tissues and why they will denude a field if not rotated and managed properly. Then I thought about chickens. Two summers ago, we transplanted mature irises next to our driveway along with a few holdouts of the grass that used to be a lawn. The grass is now taller than the irises. 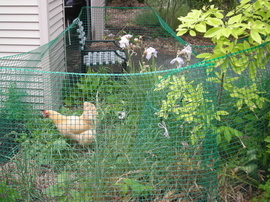 Chicken persistence seemed just the solution to deal with the tenacious grass and the extreme density of weeds. Our chickens have denuded all soft vegetation as well as grasses in their run – the avian equivalent of sowing one’s fields with salt. Technically their enthusiasm for chomping all things green denotes them as a forager. We translated their brower/grazer/pecker/digger/aerator/fertilizer abilities into a quadruple win when we let them loose in the weed infested area by our driveway. Win #1 – Our backyard chickens ate the weeds (grasses, etc.) when we constructed a temporary fence near the driveway. Fresh, fast growing weeds have soft membranes. As long as we continue to limit their time in that area and watch them carefully, we will keep them away from the denser plants we want to keep. Win #2 – The greenery supplements their diet. Win #3 – Their eggs taste better (more complex). Win #4 – We can watch them weed our own garden while we eat their eggs, an experience that attains a level of synchronicity akin to magic. Rewatching the videos I shot over the first two days of our experiment, it appears the chickens like the greens almost as much as they like digging for worms and bugs in the freshly emerging soil. Did I mention I find backyard chickens easy and mesmerizing? This entry was posted in On the Farm and tagged Backyard chickens, Corinna Borden, eggs, Real Time Farms. Bookmark the permalink. I enjoyed the videos. It makes me want some chickens for my yard.